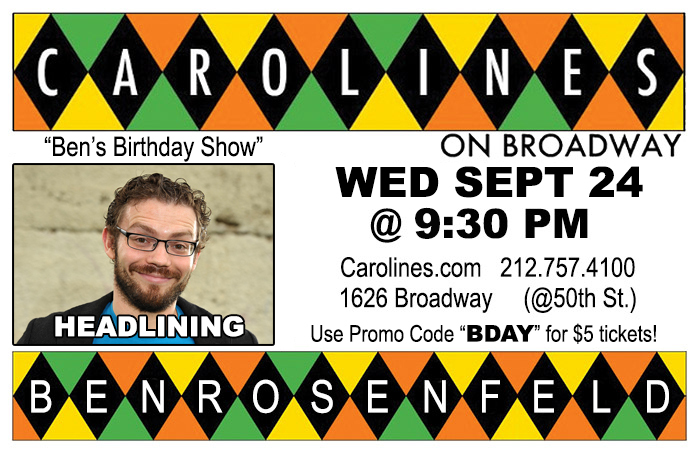 I’m thrilled to announce that I’ll be headlining at Caroline’s on Broadway (for the second time!) on September 24th. It’s gonna be an amazing show with some great comedians opening for me. Oh and it’s also my birthday! I have a ton of newer material that I’ll be doing that didn’t exist if you came out last year when I headlined. There will also be an after party with drinking and if you stay late enough, karaoke. The post Ben To Headline Caroline’s Sept 24 appeared first on Ben Rosenfeld - Comedian. Today I ran into an old friend that I had not seen in years. The last time I had seen her she was getting ready to have her first child. She's a stepmom to her husband's older twins from a previous marriage. Whatever the story is, she seems like she adores her stepkids and life in general with her current husband who by the way gave her a nice ring. WOWSA. We caught up and she mentioned her stepson, the boy in the set of fraternal twins, had brain surgery. I asked her what happened. She told me he is epileptic. This was one of two he had. As she spoke about it, she mentioned during dinner at the high holy days he was showing the pictures, and in the hospital he was ripping the IV out of his arm. Of course this grossed everyone else out but he is a seventeen year old boy. They love guts, gore, and too much information. Sickness and health does not change that. We laughed about how it takes men forever to grow up. Then I thought about it. As women we talk about our feelings and tend to over emotionalize everything and everyone. Men, they don't. They stuff them down until they think they will go away, and unfortunately they don't. Or better yet, they laugh about it. In that way, men are beyond women because they don't take themselves let alone anything that easily. So yes, the showing of the gross pictures and the ripping the IV and running around the hospital with his friends was this young man's way of coping. My birthday is tomorrow. It seems like my years have flown by. Is life what I want it to be? Yes and no. I have fulfilled some of the things on my bucket list. In other respects, I am not where I thought I would be. This point in my life looks different than I thought it would. Not better, not worse, but different. I was hit with a weird depression. I have nothing to complain about really. Some of it is fear. I have been in this place before in my life where things were moving forward and all of a sudden the wheels stalled. I am so scared of going to that place again. Someone I ran into recently, a fellow actress and writer, mentioned that instead of fear one should transform those feelings into excitement. Maybe it is the aches and pains I have been feeling lately. My gym time has been thrown off because of my physical ailments. Oye vey. The thing about pain is it makes you depressed. Then I am doing some cool things with my writing and more on that later. Still in the never ending process of releasing the audiobook. My musical is coming along. Got scouted for an exciting project and have others. Things are hippedy hopping. On my way back from a telegram delivery I saw someone from my past who used to be rather supportive of me. Instead of saying hello he turned as not to speak to me, giving me the big diss. I didn't understand it. He used to be really supportive. Had I said something to him? Just then it occurred to me. He was nice to me because he didn't view me as a threat. All of a sudden I am on TV, writing books and blah de blah. A friend once explained that I shouldn't take that crap personally. My success would not be easy for everyone. That is when I gave myself a pat on the back. His idiot action meant I was doing something right. So, he, not I needs brain surgery. I am not afraid. This next year of my life I will be excited. I should be proud. Every once in a while our minds need to be cut up whether it's physically or metaphorically. Today is my birthday. I am twenty eight years old. Yes, twenty eight years ago my mother had me in the hospital. She held me. It was a Wednesday just like today. Actually my mom had a C-Section, so she's got a bikini scar no thanks to me. My dad was the first to hold me because my mother was conked out. When they peered out the window of Magee, the hospital I took my first breath. The breath that started it all. My twenties have been an adventure so far. Twenty was a neat year, the comedy clubs and rooms of New York City became my playground. Twenty one sucked, I was in an abusive relationship with a rageaholic. Twenty two was a big pAArtying year, that ended with me giving that up. Twenty three was a big year of movement and lessons, I made my first big TV appearance on Rachael Ray, got myself in some trouble, and dated a pathological liar for six months. Twenty four sucked; I was broke, poor, miserable, but got really good as a comedian and puppeteer. Twenty five was a sort of let go or be dragged, desperate and not needing to get where I needed to go I began to create my own thing. Twenty six was a pretty awesome year, my puppet children and I were on TLC and did a press tour and I became a talking head for a website. Twenty seven saw the release of my book and it being featured on Britney Spears's website. What will twenty eight bring? I am starting to do well with my life and am not ashamed. My book is sold out on Amazon and I have to get them to restock. My puppet children and I are happy. I have my poppy seeds. I have self-esteem. Some part of me still feels inadequate like I should be farther along with my career. Like I should have millions of dollars. Like I am just some freaking failure. Like I am a Peter Panette who is unmarried and there are no children in her forseeable future that aren't puppets or fans that write her letters. On the other hand I feel pretty amazing. My book is starting to sell, and people are reading it and liking it. I am pitching it to book sellers and have two magazines fixing to interview me. I also have a radio appearance coming up and am set to be a part of a monthly show. I am trying to get my music on FM Radio. I have fans writing me letter, making me posters, writing me songs, flying in to see me. Not to mention that those who have come across me today have sought me out for my wisdom. It has been pretty trippy actually. Me, wisdom, balance? While I am a Libra I have more of the wishy, washy, snap decision and the self-righteous temper that go with my sign. As I get my footing, I am scared that this will slip away sometimes. That people won't buy my book, that this folly has been a waste of my time and energy. Then I remember what my twenty eight years on this planet have taught me. If there is anything one can do it is to be of love and service. It is to do the next right thing. It is to get the product you are selling out there in the world. It is to dream the big dreams. It is to, no matter how scary, never to be afraid. At this point in my life I have people who for some reason look up to me. Ha ha on them, just kidding. However, such a station makes me wonder about the kind of influence I am. Am I a good witch or a bad witch? For as much as I like to doubt myself, because women are taught to do that, I know the universe gives me other clues whether people surprise me by telling me about the purchase of my book, my book is featured on Britney's website, or I get a fan letter that makes my eyes water. Bottom line, ten years ago I was only dreaming of moving to the city as a kid in Pittsburgh. I was auditioning for NYU. I never thought I would get in but I did. The reason I called this blog the book of life is because on Yom Kippur, today, the Jews have this thing called the book of life that they apparently write in. They write something for each year I believe such as goals, etc. My goals are to be a strong, successful woman of influence. To operate from a place of love and tolerance, and to be an inspiration to those I meet.